This resource focuses on traditional English and North American poetry from the Elizabethan age to the 19th century. Teach this entire unit in 10 to 12 classes, or choose excerpts from it to supplement your own unit. 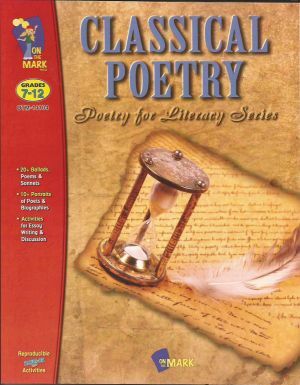 Classical Poetry contains portraits of poets which you may convert to overheads, a summary of each major period of poetry, biographies of poets, representative poems and activities for writing and discussion. 68 pages. Companion Product: Traditional Poetry. This new book comes from an independent book store. We ship on the next business day following your order! Happy to ship expedited and international.